KUWAIT—For decades, Kuwait’s strong economy has attracted millions of Arab and foreign expatriates, who often work in jobs Kuwaitis are less interested in. But recently, the Kuwaiti government has raised concern that the high number of foreign workers in the country may be keeping the country’s graduates from finding employment. “Regardless of how wealthy a country is, the overuse of its services inevitably drains its resources,” said Safa Al Hashem, the only woman in the 50-member parliament elected in November. “There are many unskilled and untrained foreigners doing odd jobs in Kuwait.” She has been pushing for tough measures against foreigners in proposals made to parliament early this month. Kuwait’s Ministry of Education last summer was reportedly preparing to fire up to 400 expatriate teachers so that 25 percent of teachers in subjects such as social studies and computer science would be Kuwaiti nationals. The Kuwaiti government has made conditions for expatriate teachers more difficult by cutting rent allowances by more than half since October and is threatening to deport teachers who give private lessons without authorization. Gulf countries top the list of the countries with the highest rate of foreign expatriates. According to a survey by Kuwait’s Public Authority for Manpower, they make up 91 percent of the total population in Qatar, 89 percent in the United Arab Emirates, and 72 percent in Kuwait. Moreover, Kuwait’s private sector employs about 1.8 million people, only 73,000 of whom are Kuwaitis. Expatriates also account for 24 percent of workers in public jobs. People from non-Arab Asian countries ranked first with 50 percent of the total labor force, followed by Arab nationals in second place with 30.2 percent. The national unemployment rate among Kuwaitis is 4.7 percent, up from 3.10 percent in 2013. Government officials have announced plans that seek to reduce the proportion of foreigners in the workforce, and some lawmakers have proposed levying special taxes on foreigners’ income. 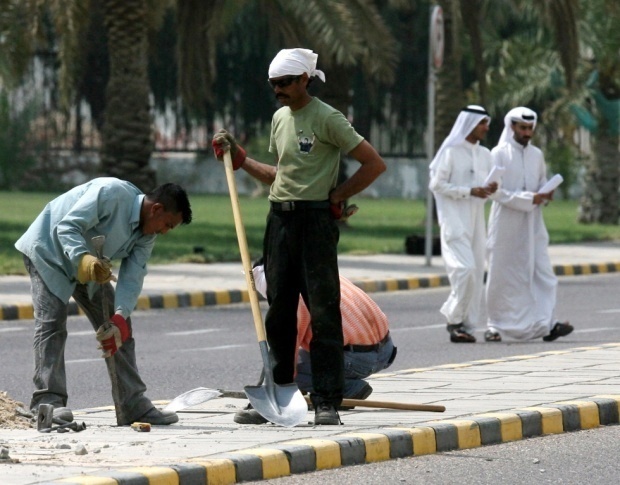 Still, many Kuwaitis do not believe that expatriate workers are the real reason for their inability to find good jobs. Al Ajmi’s comments support the Public Authority for Manpower’s survey results, which show that 58 percent of unemployed Kuwaitis prefer to work in the government sector, and would not take a private-sector job even if one was offered to them. A smaller proportion, 39 percent, would accept employment regardless of whether it’s in the private or public sector. Just 3 percent want private-sector employment exclusively. The survey also reveals that the educational attainment of most non-Kuwaiti workers is low, with 38.7 percent having only school-level education, and 34.6 percent with high school qualifications. Issa Hassan, an Arab national and human resource manager at a private company, agrees with Aman that Kuwaiti youths demand a lot when it comes to work. Kuwait University conducted a study on the increase in the number of bachelor’s degree holders over five years (2012–16) and the extent to which Kuwait University’s graduate output meets the needs of the labor market. It reveals that the labor market had 54,698 jobs to fill over that period, while the number of new graduates from Kuwaiti universities over the same period was 28,767, or about 53 percent of what the labor market needs. According to the study, the Kuwaiti labor market needs graduates in the following specialties: nursing, physical education, musical education, computer science, art education, public health, electrical engineering, interior design, auditory and speech therapy, medicine, marine sciences, mechanical engineering, engineering, archaeology and museum sciences, agricultural engineering, safety engineering, sports education, and hotel management and hospitality. While there may be jobs to fill, Mohammed Ramadan, a Kuwaiti researcher and economic affairs analyst, believes that students graduating from Kuwait’s universities are not educated in the necessary fields.